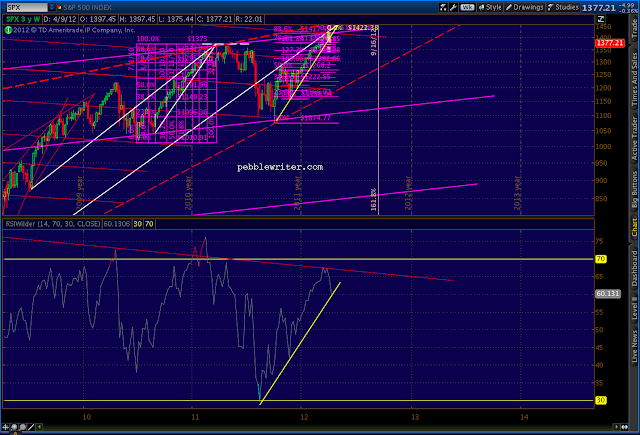 SPX overshot the Crab's 1.618, whichever Point X we use. The next major lines of harmonic support are are the red pattern's 2.24 at 1342, correlating with the purple pattern's 2.618 at 1341. 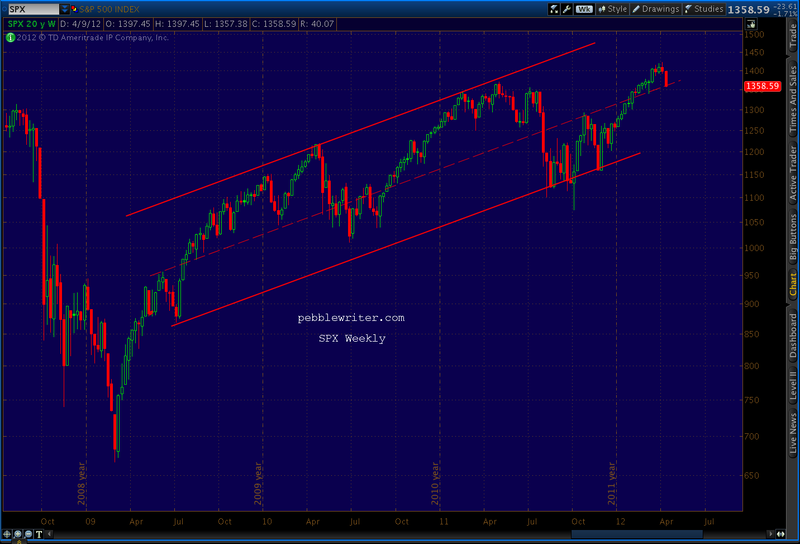 Given the level of oversold on the day, here's an alternative view. The Crab Pattern I posted about earlier pulled a fast one on us. It either busted, or I drew it wrong. 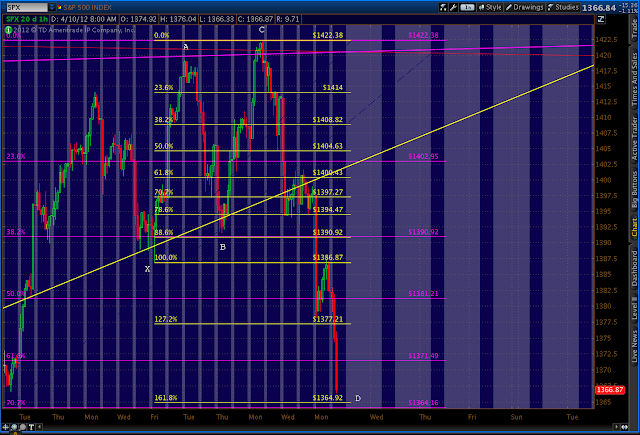 Technically, it's forbidden for Point C to exceed Point A -- kind of like Wave 1/Wave 4 overlaps in Elliottworld. But, it happens. I've redrawn the Crab to begin with the March 23 1386 low instead of the March 29 1391 low -- which means that the 1.618 extension is 1364.92 instead of 1372.51. 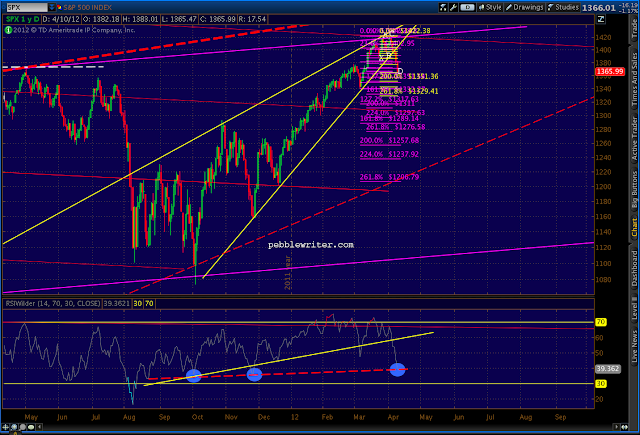 Note the daily RSI tag on the same trend line (red, dashed) that stopped the Oct 4 and Nov 25 declines. The previous tags are highlighted in light blue. 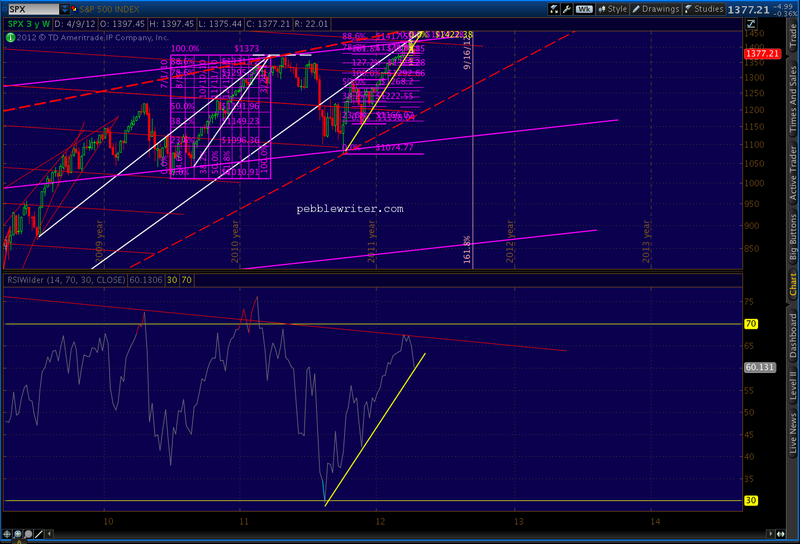 This decline is picking up momentum, so the RSI TL and the Crab pattern might get mowed down. But, be cautious. Like any trading system, once you start bending the rules in Harmonics, it opens up a can of worms. 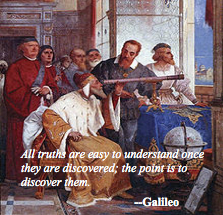 Markets frequently overshoot logical targets, and it's no cause to discard the methodology. I'm taking some profits off the table at these levels, and will let the rest ride essentially risk free. 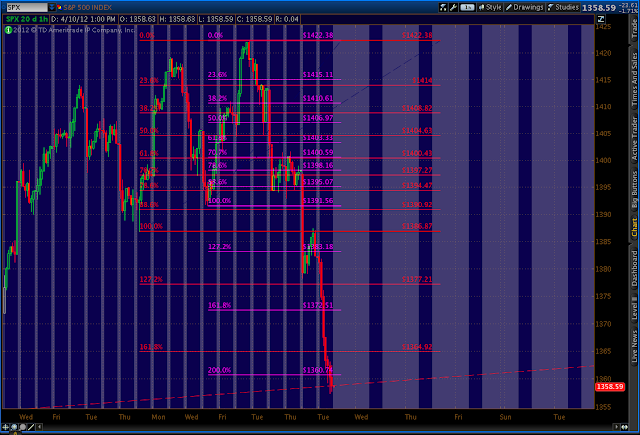 Note that 1364 is the .707 of the 1340-1422 move. 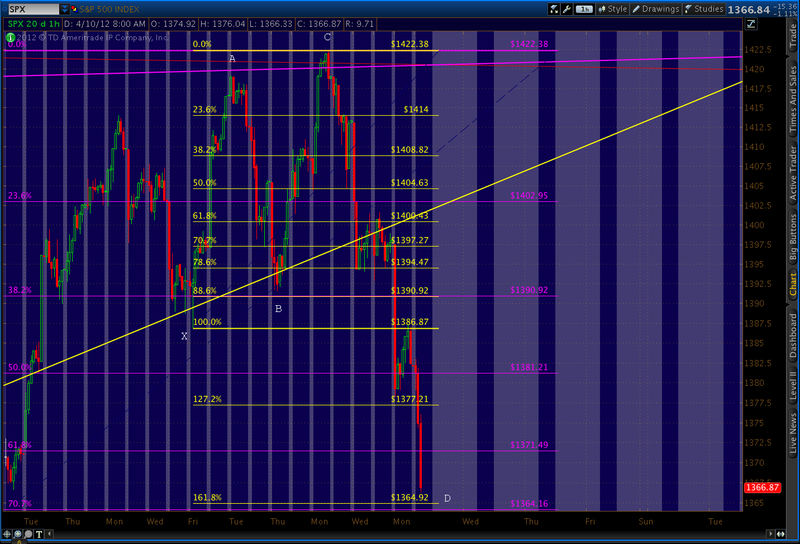 If it doesn't hold, the next support is at the .786, which would equal 1357. An intra-day push to 1357 and close at 1364 would be interesting. After yesterday's close below the rising wedge, we can safely consider it officially broken. Now, the question is whether SPX will freefall in an epic fail of the bull market, or find support at some interim level for another leg up. 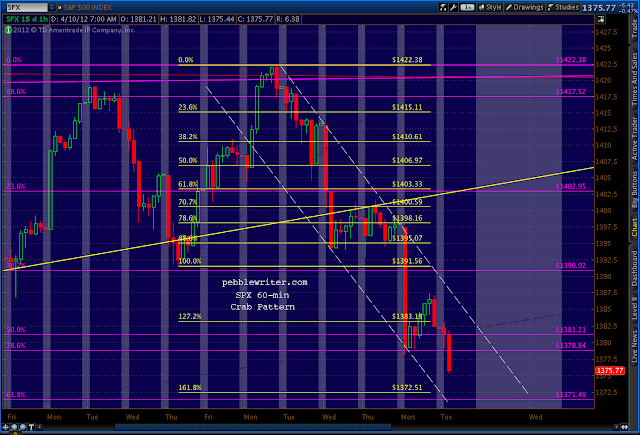 In the near term, we're approaching a potential Crab Pattern turning point at 1372.51. We might have reached it yesterday but for the little acceleration channel SPX has been in since 1422. Today, the channel passes right through 1372, so we could get a good test. This isn't a big pattern, so we might not see earth-shattering results, but it should be good for at least a nice bounce if not an outright reversal. I think an outright reversal might be in the cards, though. The hourly RSI shows positive divergence with this morning's leg down, and daily RSI shows a tag of an important internal trend line. 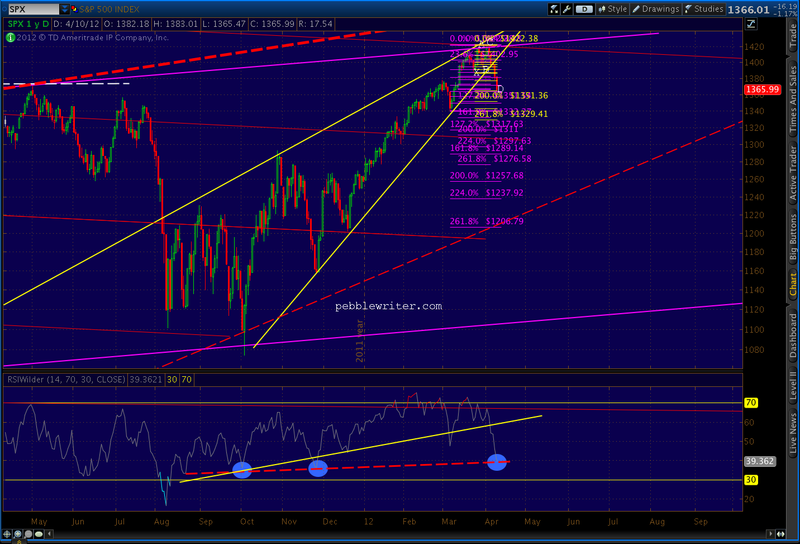 But, it's the weekly RSI chart that, as a bear, really gives me pause. I've also been watching VIX's price action, constructing some probable channels months ago: the yellow channel guiding the downside, transitioning to the red channels for the subsequent rise. Since then, I've barely adjusted them. Note how well they've called the turns. 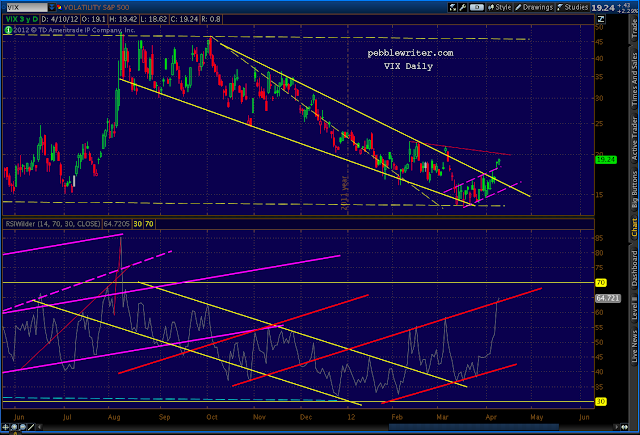 At this point, they hint at a likely breather for VIX. All things considered, I think we're likely to see a backtest of the VIX falling wedge that will correspond with a return to the other side of the red channel. 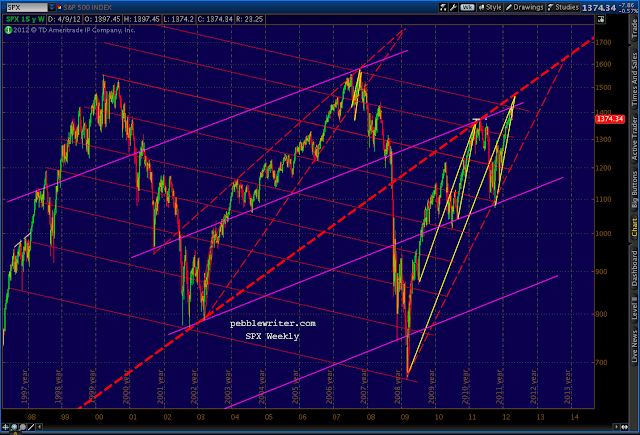 It could happen any time, but might well occur coincident with the afore-mentioned bounce in SPX. More importantly, however, we'd tag the upper bound of the huge rising wedge (red dashed) that dwarfs the rising wedge (yellow, solid) that just broke down. 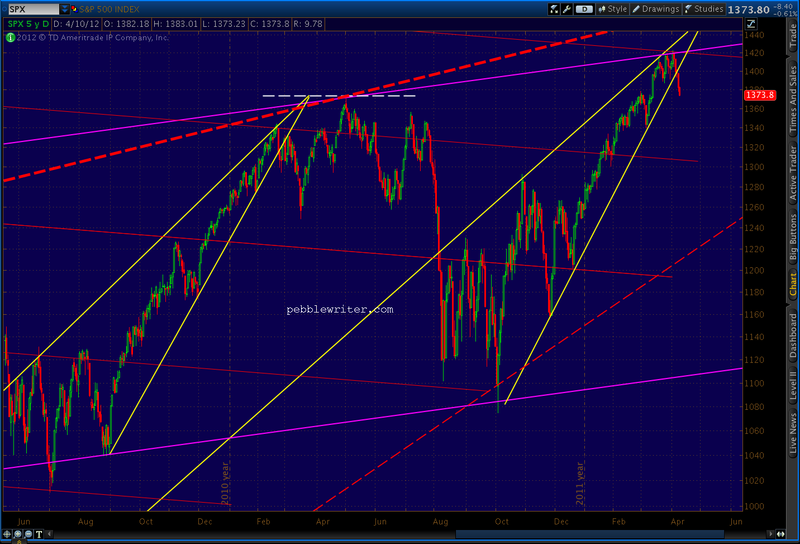 I've drawn its upper bound as the biggest, boldest red line I can muster on the above chart. Why?